X-10 CROSSwire is the leading modular display framework from 200m2. Designed primarily for the exhibition display sector, CROSSwire is ideal for dressing exhibition shell schemes or for creating display towers and Point of Sale displays. 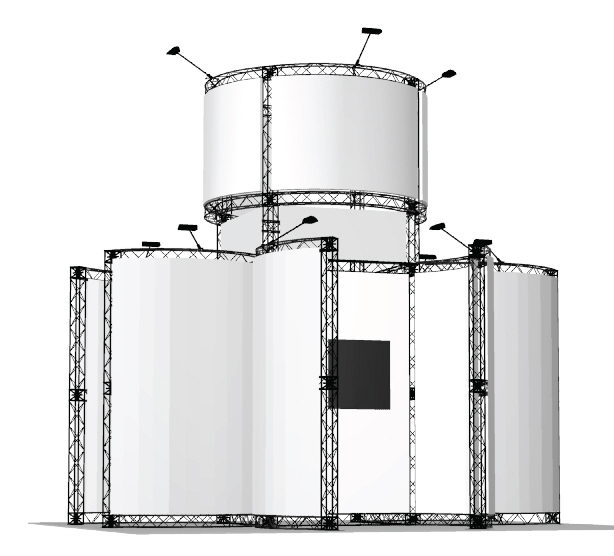 CROSSwire is easy to build and extremely lightweight, making it the most portable exhibition system in the world. Being modular, CROSSwire can easily be re-configured to suit any floor space / height. It is immensely robust and can even be used outdoors. Most exhibition trussing or gantry systems are made from steel or aluminium tubing. Being very heavy and difficult to build, traditional systems do not fully integrate with signage, electronic displays or lighting concepts. CROSSwire is totally different. Being made of aluminium and composite materials, it is incredibly light. Graphic panels, lighting and display screens simply attach to the trussing to create a professional display. Through the extensive use of composite materials, CROSSwire is extremely strong yet easy to transport. With a range of innovative connectors, CROSSwire modules are easy to build without the need for tools. Unlike other trussing, our composite materials are impervious to scratching and stay looking fresh for years. Fully weatherproof, CROSSwire can be used outdoors without degradation. Fully integrate your stand with back-lighting, plasma screens, literature holders and counter tops. CROSSwire comes in black and white as standard. Bespoke options in any colour are available however! Lease in modules as required. Add a display wall or reception counter! Bring your X-10 stand to life and create eye-catching, dynamic visuals with the X-PO Light backlit display! Designed for different sizes of displays or exhibition stands, the X-Module family combine to create one of the most flexible and scalable display / exhibition stand systems in the world. There are three solutions in the X-Module range. From smallest to largest, they are: CROSSwire (X-10), EXPOwire (X-15) and TRUSSwire (X-20).